This was a successful fireplace installation in a property in Andover, Hampshire. Our task was to install the Beaumont stove 5kw by Chesney’s. With its elegant refined appearance, this stove looks at home in the most sophisticated of interiors. This design includes swept cabriole legs as well as a corniced top section; features not found on other stoves. The wood burning stove is DEFRA exempt for use in smoke control areas which means it can be safely and legally used to burn logs in all major cities and towns throughout the UK. Net efficiency rating 84.5%. The Chesney’s best selling stove is a popular choice amongst our clients. 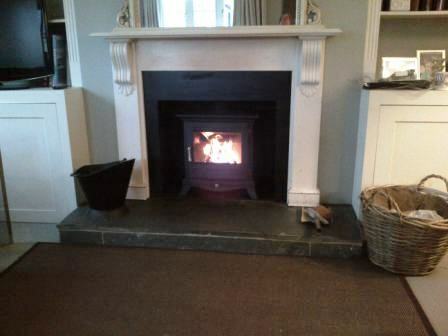 View another Beaumont stove installation we carried out.